I'm sure at this point you all know how much I LOVE Dream Sessions and creating magical worlds and making dreams come true for people. Really, it's one of my favorite things to do. But I also offer Something called a Styled Session. This is when someone comes to me with a theme or idea like a sweet romantic camping trip, Circus day, or a date night in the park. I then take that Idea and come up with a color scheme and sketch out what the session will look like. Next I shop for items that make your session t heme really pop. This could be things like blankets, pillows, mason jars, cupcakes... really whatever goes into that idea. On shoot day my assistant and I set up your shoot. Each and every detail matters and they generally take us a good couple of hours to put together. If you show up early enough, you may even get to see us putting the finishing touches up. There are literally so many things you can do with a Styled Session. I even have some of my most common ones like Adult Cake Smash, Paint Fight and Milk bath listed ready for you under the Styled Session menu. This week though I wanted to share with you all a simply adorable Styled Session I did with two very awesome people a couple weeks ago. The session theme was "Date night at sunset". 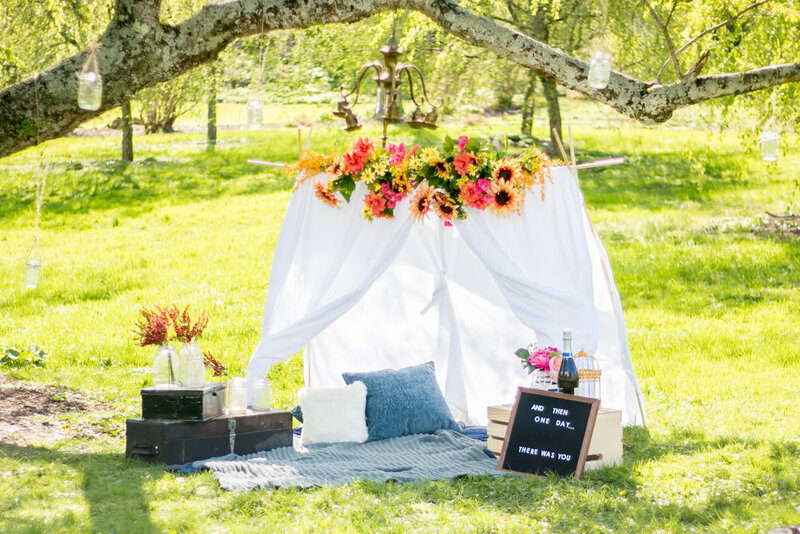 We built a tent and put a beautiful flower archway over the top of it, hung some jars from trees with a big chandelier in the middle. Added blankets and some cozy pillows along with other little nicknacks to really build the perfect little scene. I want to send a shoutout to my good friends at Wild Things Antiques in East Walnut Hills for supplying some key details in this. - Peep the Chandelier, mason jars and super cool vintage boxes on the left. 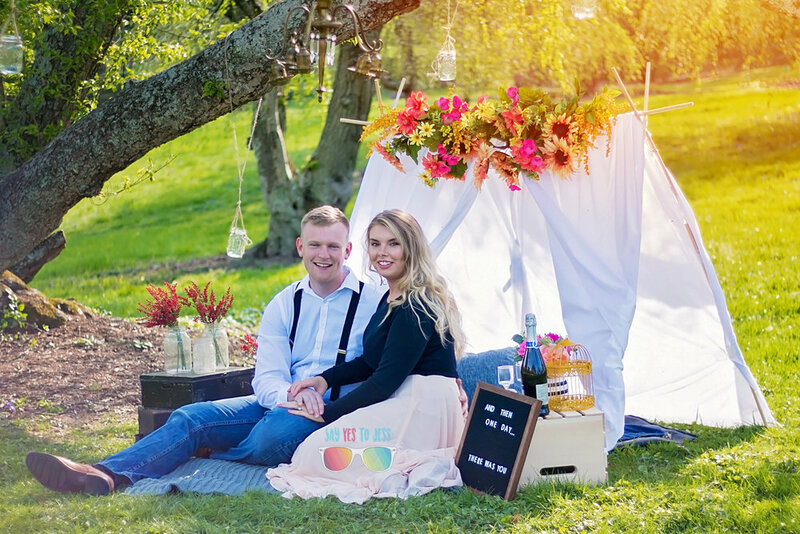 When my clients got there the sun was at the PERFECT spot to take the photos. It basically illuminated the entire location with this beautiful golden ray. We even had champagne and cupcakes to go with it! Talk about a magical session. The weather, lighting, couple and set were all perfect. AND It even ended with an impromptu cake fight. Exactley how I like to end everything. If you liked this weeks post, please share! Want to book your own session like this? Message me or Book now! Check out the BTS video of how this was put together below!